"I'm looking for my wife." "She hadn’t disappeared, it was he who was afraid of disappearing." This movie is absolutely crazy, but it's also about someone going absolutely crazy, so it kind of makes sense in a senseless kind of way. In reductively simplistic terms, The Strange Color of Your Body's Tears is a giallo-tinted mystery/horror thriller wrapped around a commentary on the sexual politics of giallo-tinted mystery/horror thrillers. That explanation is too basic not only because the film simply has more layers than that description implies, but also because of the sheer experimental nature of the film’s editing and general visual presentation. 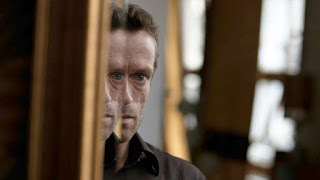 The story begins when a man comes home to find his wife missing, and from there it follows a series of encounters between him and the people he talks to in his search for her. Far from remaining a simple detective story, however, it quickly becomes apparent that these conversations carry more surreal or abstract psychological and emotional significance than your average conversations. As the dialogue and its accompanying visual imagery become increasingly outlandish, it gradually becomes clear that these characters are more like psychic archetypes or symbols than real people. The thematic topics under discussion focus primarily on sexuality and violence, particularly man’s fear of female sexuality and the violent extents he’ll go to in order to suppress it. The central visual metaphor of the film is one of probing holes: stabbing wounds, drilling walls, poking sheets, etc. With sexual concerns brought so immediately into the foreground, this imagery stands not only for the generalized heteronormative male sexual experience (entering the woman), but also and more importantly the reversal of this power dynamic (male fear of being entered). The horror in the film derives primarily from this penetration anxiety: man's fear that his dominance of women will be threatened by their empowerment, and that they will in turn subjugate him as he has them. The sexuality of this imagery is then reduplicated in the realm of violence: when entering a woman sexually isn't enough to subjugate her, the man desperately reaches for a more permanent solution (a knife, a drill, a hammer, etc.). Man's perceived dominance of woman relies on his ability to penetrate into her body, both figuratively/mentally and literally/physically. The Strange Color of Your Body's Tears shows how this sexual violence is grounded in a kind of desperate impotence, a recognition that masculine power is fragile and could collapse at any time. However, because of the ambiguous nature of the visual imagery throughout this journey, it is vastly open to interpretation. The magic of its enigmatic meaning and beauty lies in its experimentation with cinema as an art form. 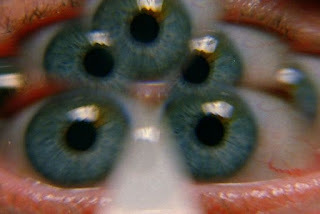 Most reviews at some point describe it as kaleidoscopic, which is a good word as description both of its vibrant colors and of its formal ability to morph inexplicably before the viewer's eyes; but it also fits because at one point the film literally uses light and mirrors to create a kind of kaleidoscope in front of the lens. It's also a convenient way to encapsulate the film's multifaceted visual delights, including everything from claustrophobic cinematography (highlighting the fearful tone), to symmetrical frames and up to four-way split screen (fragmenting reality as it is for the protagonist), to sequences played at a single frame per second (distorting space-time as a representation of the unconscious). It's also impossible to overstate how well crafted the sound design is. There's very little dialogue as a general rule, and the majority of the aural storytelling rests in the hands of the sound designers and editors, and they make it exactly as expressive as it needs to be. The sound has a unique, hand-crafted feel to it that makes every noise stick out and creates a distinct soundscape. This sound is then used to set the atmosphere, to build tension, and to craft this unconscious world inside the character’s mind. 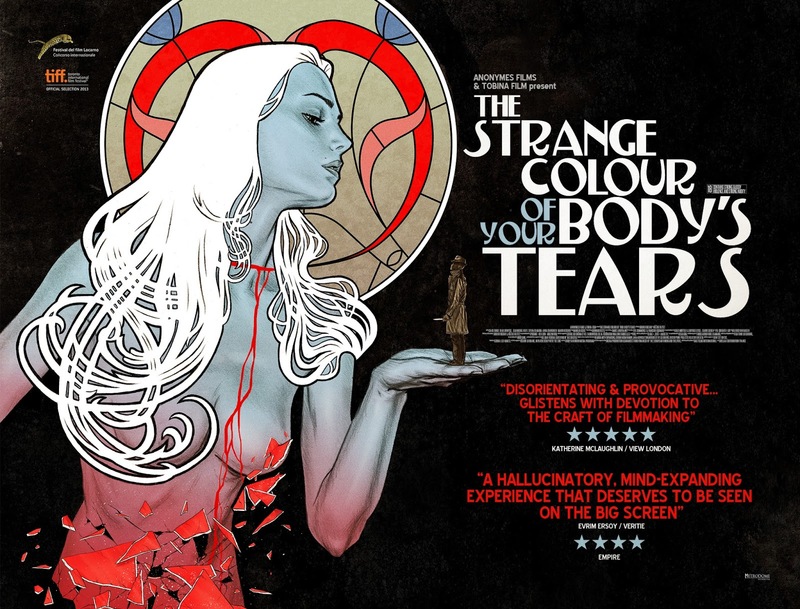 As a film, The Strange Color of Your Body's Tears is perplexing, haunting, dreamlike, and grotesque, but it is also intriguingly powerful and psychedelically entertaining. For all its unforgettably disgusting or confusing imagery, there's a kernel of reality buried beneath it, waiting to be unearthed and examined by anyone with enough of an open mind to accept it in all its perverted beauty.